Danxia Mountain Geological Park is renowned for its unique red rocks and cliffs, which are similar to Danxia (red rays of the sun). 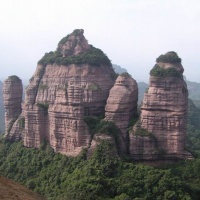 Located in Renhua County, 50 kilometers away from Shaoguan downtown, this famous China's Red Stone Park is also the name place of "Danxia Landform" in geography. Covering an area of 290 square kilometers, the Danxia Scenic Park has over 680 unique stone hills, walls and pillars in various sizes, making it a sculpture garden of red sandstone rocks. The Bazhai Peak is the highest one in the area, about 618 meters above sea level, with other peaks sheer and steep, soaring straightly from river bank. Some of the steep red cliffs are accessible through the ancient steps, plank path or newly-built railings; others are too precipitous to climb. Watching Sunrise Pavilion on the Zhanglao Peak is a popular place for sunrise. 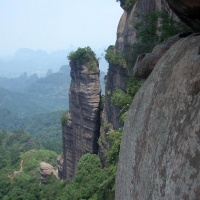 Yangyuan Rock (Male Organ), Yinyuan Rock (Female Organ), Wangfu (Longing for Husband to Return) Rock and Longlin Rock are regarded as the ''Four Beauties of Danxia Mountain''. The area is covered with sub-tropical evergreen vegetations in a rich variety due to the moderate subtropical climate and yearly monsoons. 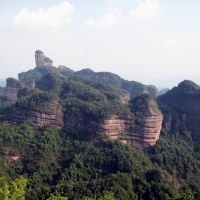 There are several ancient trees with history of several hundred years; Danxia Phoenix Trees are native to this area and are the most distinguished species of the mountain. The Jinjiang River at the entrance of Danxia Scenic Area, originating from the forest of Nanling, winds its way through the unique-formed mountain area, with beautiful reflections of the bamboo, trees and countless red rocks. It is great experience to take a boat down the river and view the legendary beauty that rivals the limestone cliffs of Guilin. The Biezhuan Temple, located on Zhaolao Peak, is one of the ten most notable temples of Guangdong. In addition, the mountain has been a busy place for Buddhism activities since the Sui (581-618) and Tang Dynasties (618-907). Through years, there are eighty temples were built in the mountain area and attracted a large number of visitors. Poems, carvings and inscriptions praising the bewitching scenery were left together with many cliff tombs and cliff coffins of times long ago.